The idea of switch manufacturers was entering the new fiber transceiver era. Implementing only SFP+ or SFP cages for being more flexible for future needs. Copper ports were only implemented for management purpose so far. But there were a couple of applications in the past with 1G where Servers or other components do only have 1G copper ports. So 1G copper SFPs had the right to exist. Now all connections moved from 1G to 10G and the copper ports disappeared so far. But a while ago some vendors started implementing 10G copper to their devices again. One of the main applications in data centers is using SFP+ DAC cables. But the use of "normal" RJ45 cables is often easier than using a copper DAC. To have a great interoperability between existing fiber switches and those with 10G copper ports Flexoptix is providing a 10G universal copper SFP+ which also can be used used with speeds of 100/1000Base-T. 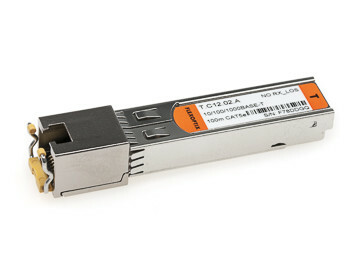 This makes Flexoptix' Universal 10G copper SFP+ (T.C96.02.KF) backwards compatible and therefore usable for nearly every copper infrastructure.